I have always enjoyed cars. I had a large Matchbox collection growing up, but I never really considered myself a car enthusiast prior to meeting the group of Nator locals that I have the pleasure of knowing now. 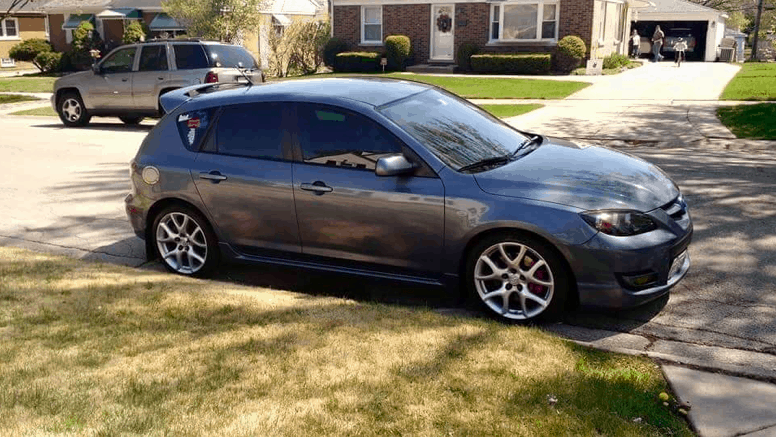 Honestly, I wasn’t aware Speed3s (or Mazdaspeeds of any type) even existed prior to helping a friend car shop and talking them into getting a 2012 Speed3 we had looked at. From that endeavor, I was brought along to my first Nator meet. At first I was kind of boggled at the concept. I’m sorry, you wanna go to some random person’s house that you met on a forum and let them put parts on your brand new car, in exchange for some beer? That was almost 3 years ago. Now I own my own Speed3, which I learned to drive manual for (a feat I thought would always be lost on me), and have made friendships near and far. I have traveled to parts of the country I wouldn’t have seen unless I had a Nator meet calling me there. I’ve learned so much from this community in the 3 years I’ve been involved, none of which would ever have crossed my mind. As you can imagine, although I appreciated cars and lusted after the ones I dreamed of owning, I was not handy with a wrench in the slightest. All of the mods on my car are explicitly possible because of my friends in Nator. I helped with the installation of many of them, but would’ve been lost without a mentor looking over my shoulder, telling me exactly what to do and having the patience to work with me. For that, I will always be thankful and hold a lot of respect for them, and most importantly, cherish the type of brotherly love that comes from bonding over a mutual interest. The Speed is a badass car. Every day I drive it, I smile. I think of where I am now, where my car is now and what trials and tribulations that have brought Cosmo (yeah I named my car, step-off!) and I this far. However, THE COMMUNITY is what really sealed the deal. I wasn’t looking for a car when I bought my Speed — I wanted to bond with this amazing and knowledgeable community of people from all different walks of life, and geek out over these cars! It’s not about the free/damn near free parts from my Nator Bros (this is a blanket term for EVERYONE within the community male and female alike), it’s not about labor at the price of some beer and food, it’s not about being noticed, it’s not about being the best whatever, it’s about realizing there is knowledge, BOAT LOADS OF IT. It’s about respecting that and helping with whatever you can. Whether you’re a parts runner or looking at a car for someone not in the area, or loaning/giving parts and services to others in need, you know you’re helping the community. You’re paying it forward in the ways you are able to and doing your best to grow yourself. 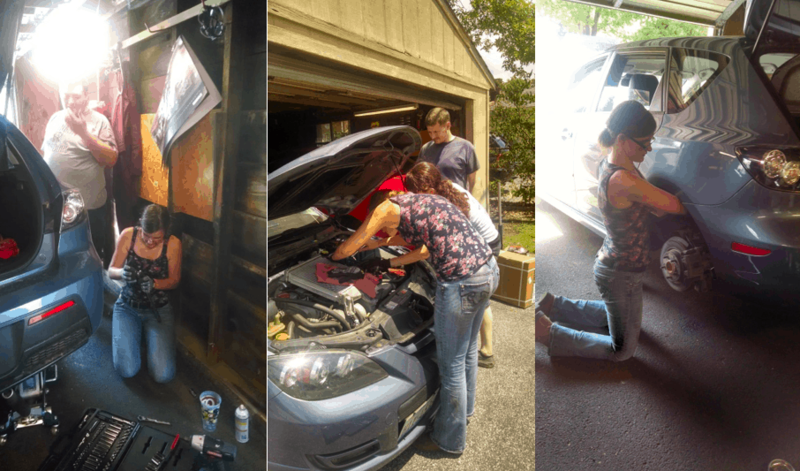 THAT is what being a Car Girl means to me. I have seen intense days and nights of labor on jobs, that would take most people weeks to complete, be completed within hours or days simply because a brother was in need. MULTIPLE times. I can include myself in this count, my car needed an emergency clutch job unexpectedly. Between the community scrambling to get me a list of parts I needed and lending the ones they had already laying around, to working late into the night to get the job done, I had my car back within a day of it going down. It’s the real deal. Respect it and you’ll have a family to laugh, cry and share stories with for years to come and all you need to do is just be cool. Be one of them. Nothing special. The community is already special as a whole. Fae is a Systems Integrity Rep (Inside Sales/Administrative) and owns a 2008 Mazdaspeed 3. Modifications: COBB V3 Accessport, Corksport Intake and TIP, Fidanza Flywheel, Autotech Internals, Damond Motorsports RMM, Ultimate Racing Test Pipe, Bilstein B8 Shocks/Struts, COBB Lowering Springs, Forge V1 BPV, Rally Armor Mud Flaps, Maisonvi Custom Shift Knob & Phate Tuned.